Home » Caretaking » 9-27-2014 Plantings for National Public Lands Day! On National Public Lands Day, the Friends of Glen Providence Park will plant native trees and shrubs along Broomall’s Run and by the stage, to restore the areas disrupted by streambank and stage repairs this summer. This project will also create a riparian buffer, improve wildlife habitat, and beautify the park! 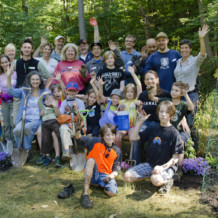 We had a lot of fun at our streamside buffer planting for Earth Day in 2012 and our streamside plantings for National Public Lands Day in 2013 – join us as we take on this next planting project! We are incredibly grateful to Delaware County Parks & Recreation for providing funds for this project, to the Delaware County Conservation District for donating deer fencing and several trees, and to Taylor Memorial Arboretum for donating trees and shrubs. This is the 4th National Public Lands Day the Friends of Glen Providence Park has participated in, and our 11th public volunteer day, in addition to smaller projects and regular Invasive Plant Removal days. To help us plan our time effectively, and to plan for refreshments, we ask that you RSVP for this event at FriendsoftheGlen [AT] gmail.com- please let us know the number of volunteers in your party. – sitting back and admiring the new plants! Our rain date is Sunday, September 28 at 9:00 am. If the weather is not clear, we will post here and on our facebook wall by 8:45 am Saturday advising whether we will use the rain date.